Pharmalast – The ultimate in elastomer technology for the Pharmaceutical and Bioprocessing Industries. The Pharmaceutical and Bio-processing industries are constantly increasing the requirement for an elastomer that has excellent purity combined with almost universal chemical resistance. In answer to these demands, Sealing Projex can now mould custom parts and standard O rings from Pharmalast 643. 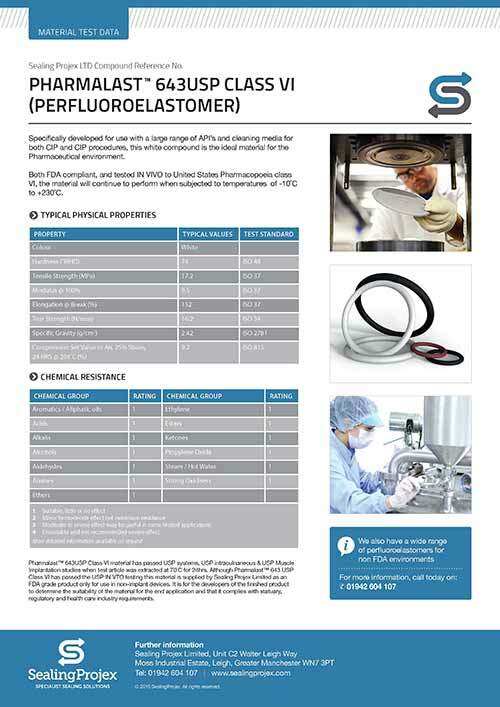 This material is a Perfluoroelastomer (FFKM) which is not only FDA compliant but also USP Class VI. With a temperature limit of +230 degrees C this is the perfect material to be used in any CIP system. Please see the Pharmalast data sheet for further information by clicking on the image below. https://www.sealingprojex.com/wp-content/uploads/2015/12/SP-Logo-300.jpg 0 0 Paul O'Connell https://www.sealingprojex.com/wp-content/uploads/2015/12/SP-Logo-300.jpg Paul O'Connell2015-03-16 12:16:122015-03-16 12:35:53Pharmalast – The ultimate in elastomer technology for the Pharmaceutical and Bioprocessing Industries. 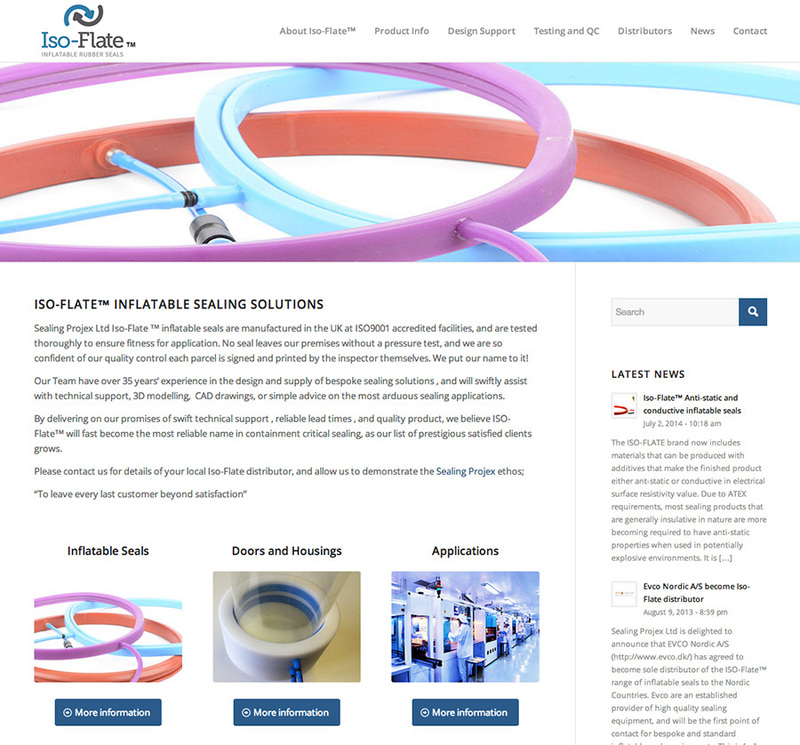 Sealing Projex are pleased to announce the launched of www.iso-flate.com a new web site dedicated to the Iso-Flate™ range of inflatable sealing solutions and supporting services. Due to the demands from Industry regarding Atex regulations for combustible powders, Sealing Projex have developed materials that are Anti-static and even conductive in surface resistance value. Sealing Projex have now produced Extrusions, Flexible connections and even conductive Inflatable seals that meet these hazardous environment regulations. The common industry’s served are Pharmaceutical, Nuclear and Semi-conductor. If you require an anti-static Sealing Product for your application please feel free to contact us for further information. Spec sheets for all materials are available upon request. We are pleased to announce that after significant investment and completion of extensive staff training, we are now in a position to provide design support in 3D format. 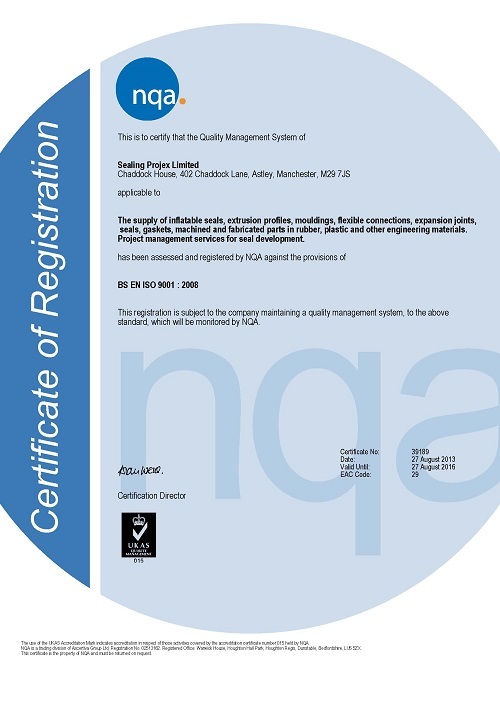 We are certain this will provide further added value to our existing clients who have come to rely on our ability to convey ideas quickly and effectively, and also assist in highlighting our benefits to potential clients requiring bespoke sealing solutions. We believe this is an essential step as we aim to become the first port of call for high containment seal solutions . Please feel free to request any of our existing Inflatable seal profiles in the required 3D File format. 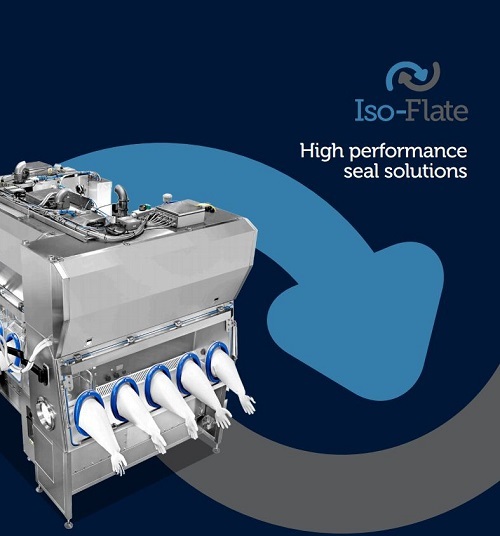 The Sealing Projex team are delighted to introduce the latest Iso-Flate ™ brochure : dedicated sealing solutions for Pharmaceutical process and containment applications. Our experienced technical department are ready to assist your engineers with a wide range of products such as Inflatable Seals, Flexible connections and many more designed for use in the most demanding, production critical environments. Click the image below and discover why ISO-Flate is the chosen brand for some of the industries most prestigious names. The brochure can also be downloaded from our Inflatable Seals page. Sealing Projex ltd have recently developed an economical solution in producing tri clamp flexible connections for a large pharmaceutical company. Moulded tri clamp flanges are produced which are then vulcanised to any length of sleeve, reducing the need for expensive tooling to produce one piece connections of varying length and tri clamp size. The flange design incorporates an internal lip of the same thickness of the sleeve, leaving a smooth internal face with no potential product build up. Sealing Projex , specialist suppliers of inflatable seals to the Pharmaceutical industry, are always willing to develop the best solution to any application. Sealing Projex have the ability to produce ISO-Flate ™ inflatable seals with fully vulcanised 90 degree corners, for axial inflation. 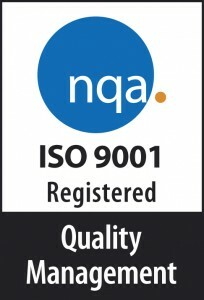 This particular seal (shown below) was made from a 60 shore black EPDM, and was designed to seal a high pressure environment in a peat processing factory in Canada. The seal retainer (white HDPE) was machined by Sealing Projex, so that the full unit was pre-assembled, tested and ready for swift implementation in time for the plant shut down. This further demonstrates the ISO-Flate ™ inflatable seal product (and technical team’s) versatility in producing the best possible sealing solution for any given application, worldwide! Sealing Projex have a technique to manufacture inflatable seals that can span gaps of up to 100mm . To achieve this we adopt the Vacuum Membrane product. The seal is manufactured in an “inflated” state so that there is already a positive seal without pressure involved. Vacuum is applied to displace the profile and give clearances of up-to 100mm in section. Once the vacuum is released and a positive pressure applied there is a wide seal contact face giving gas tight levels of sealing. 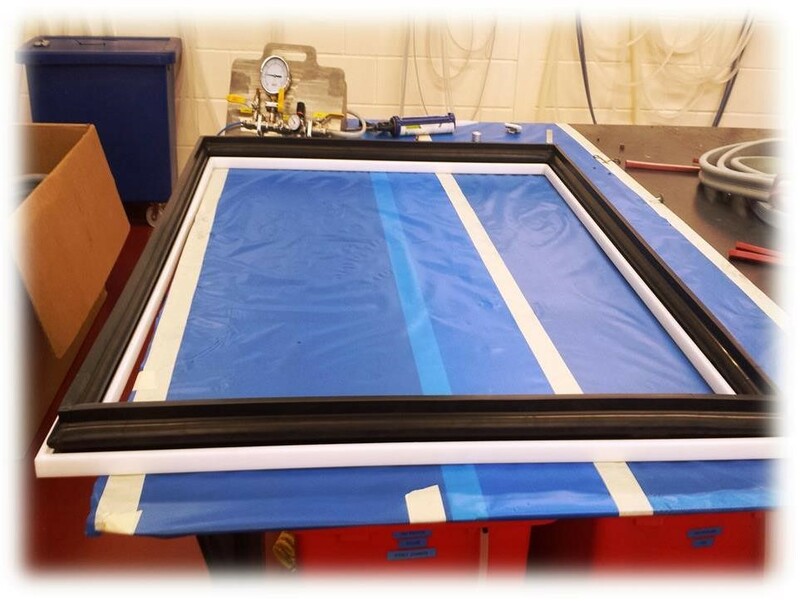 Sealing Projex Vacuum Membranes can be manufactured for radially in / out and axial orientations. The most common material for Sealing Projex Vacuum Membranes is Silicone, however other more exotic materials are available on request. These designs are particularly useful for sealing inwardly when large clearance is required, as standard inflatable seals can buckle and deform unless seal gap is extremely small in such cases. One common application is drum sealing within high containment areas. please see video below for example of one of these seals in action during a pressure test session. Sealing Projex Ltd is delighted to announce that EVCO Nordic A/S (http://www.evco.dk/) has agreed to become sole distributor of the ISO-Flate™ range of inflatable seals to the Nordic Countries. Evco are an established provider of high quality sealing equipment, and will be the first point of contact for bespoke and standard inflatable seal requirements. This is seen as a key step in establishing the ISO-FLATE™ range as the first port of call for worldwide sealing, actuating and clamping applications, particularly for Pharmaceutical, Sterilization and Powder Handling processes. In conjunction with the expansion, Sealing Projex are constructing a dedicated ISO-Flate™ website. If you are interested in becoming a distributor of ISO-Flate™ , please contact [email protected].